Bioenergy ~ subtle energy ~ power of the mind? This amazing device invented by Hungarian scientist George Egely defies belief – but it works. The wheel spins in different directions depending on how it is approached, generally with the palm of the hand. The speed of movement indicates what the inventor calls the Vitality Quotient (VQ). Stronger vitality and mindpower will influence the motion of the wheel from further away. The power of thought and intention is well known, utilised in radiesthesia and radionics. Normally in these modes the vitality is measured with a pendulum and, for example a Bovis biometer. Check it that way and also with the Egely Wheel for comparison. Try it before and after a therapy treatment. Practitioner as well as patient. There are many applications under differing conditions. 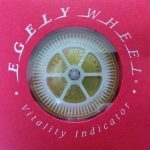 Using the Egely Wheel is a serious and also fun way to get some feedback as to your general vitality. 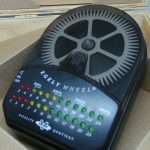 Also a great device for anyone to experiment with in helping expand their mental abilities. 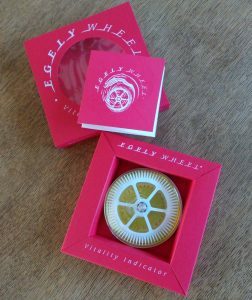 There are two versions of the Egely Wheel at present. The basic Vitality Indicator and the more advanced Vitality Meter. 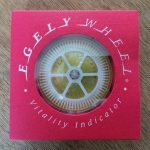 Follow the pictorial instructions which come with the Vitality Indicator and on the official Egely Wheel website. The background colour of the Vitality Indicators can vary but they still work the same. 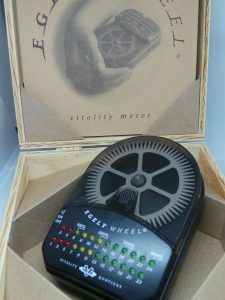 The Vitality Meter comes in a protective wooden box and instruction booklet. This unit is an electronic device (battery included) which shows the vitality by flashing different coloured lights.